Where to hang your treestand to help increase your odds of tagging a buck. One challenge bowhunters face each season is finding the perfect tree to place a stand. 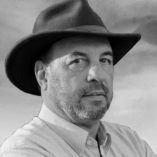 There is more than just locating a good tree to climb or to set a lock-on stand. The tree needs to be in a good condition for a treestand and in a location for a buck to walk into bow range. Scouting an area and locating fresh sign is a primary rule for bowhunters. Deer hunters with firearms only have to be in a general area. If they select the wrong tree by 20 yards—no big deal. However, for archers the wrong tree can be the difference in venison for supper or a tag sandwich. 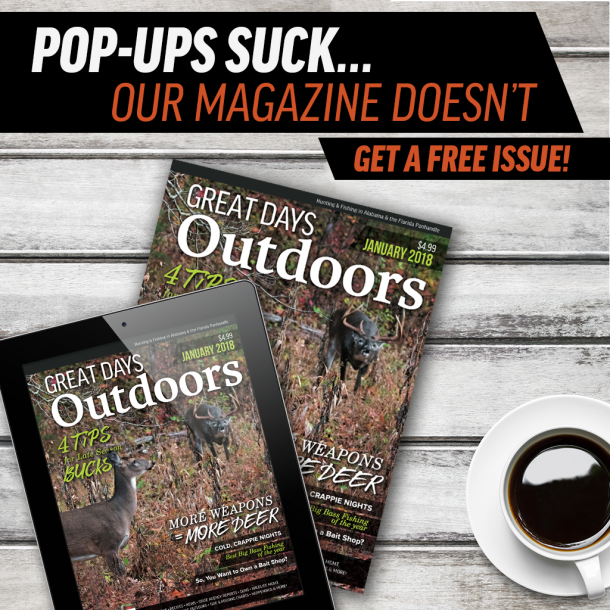 But how do bowhunters go about locating not just an area with deer sign, but choosing a tree in the sweet spot where a buck is most likely to venture in early archery season? I hope we can answer that question so you can have your spot pinned down for opening day. Any bowhunter worth a good climbing treestand knows that deer love acorns. Once the nuts of fall begin hitting the ground, they attract deer like kids to a candy store. However, the more acorns that hit the ground the tougher it can be to pinpoint exactly where the deer will feed. Not all oaks drop acorns at the same time. White oaks produce deer’s favorite acorns since they are low in tannic acid. The tannin is what gives acorns and other nuts a bitter flavor. The white oak generally drops its fruit every season. Some exceptions being a late frost or very dry conditions through the summer. Red oaks are probably the second choice for palatability among acorns for deer. It takes two growing seasons for red oaks for their acorns to mature. Red oaks that dropped last season won’t have acorns this season. However, all red oaks are not on the same acorn cycle. During dry summers, bowhunters should check for acorns along creek bottoms. The soil in those areas will have more moisture and therefore the oaks are in better shape to produce fruit. Also, swamp and low-lying areas that hold water are more likely to have oaks bearing acorns. On ridge tops, look for oaks on the east and south slopes. These spots receive more sunlight and trees along these areas may drop their acorns first. Wildlife openings, green fields or food plots can be an asset to bowhunters during the early season. Most hunt clubs and lease managers plant plots by mid-September. Depending on the weather and planting dates, the plots should have some good growth by the opening day of archery season. In areas where acorns are few or not yet dropping, food plots can save the hunt for bowhunters. Young, tender plants will attract deer—both does and bucks. While the bucks are not seeking out does in most areas of the state, they are hungry and looking for a fresh food source. Game cameras placed around the plot can help hunters determine when and where the deer are approaching the field. It is wise for bowhunters to set up game cameras well before the season opens to learn the deer movement in and out of the plot. 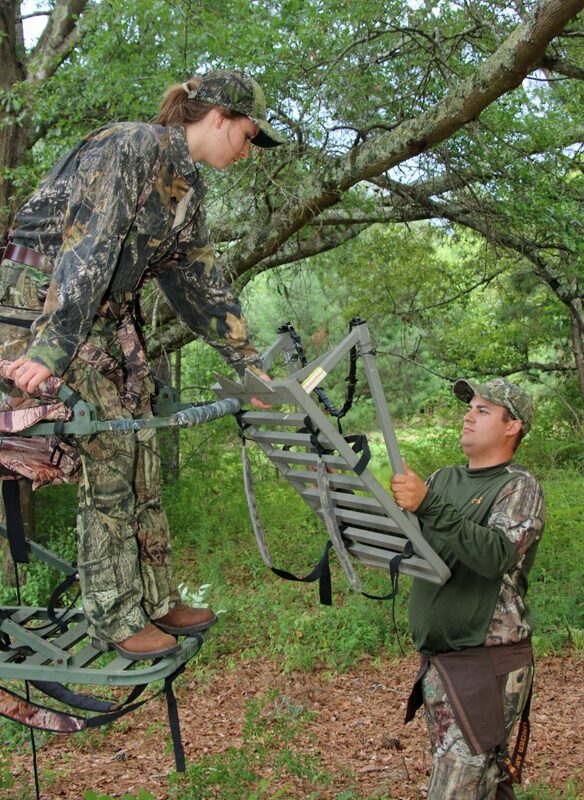 Knight advises to place your treestand where the deer can’t see the ladder section. He says you want your treestand where you can shoot the field but also in a position to shoot behind you if the deer approach from that side. Finding the trails for entry and exit from the food plot is the key. Bowhunters should select trees that provide plenty of concealment when in the treestand. Deer will be on alert entering the food plot, especially before nightfall. A good tree choice is a large diameter and plenty of limbs on either side. Knight explains that large trees move less when the wind is blowing. Also, large tree trunks can block the wind from your back and help keep your scent from blowing into the field. Another top choice for bowhunters looking for a desirable stand location is ridges. While archers in the extreme southern part of the state have relatively flat hunting areas, a majority of the terrain over most of the state have some ridges and hills. Ridges or fingers (as some hunters refer to) offer a good location to arrow a deer moving to bedding or feeding area. In most sections deer will utilize ridges as travel corridors. They have the advantage of seeing, smelling or hearing any approach of danger. Knight says he prefers to place his treestand on the top of the ridge with some thicker brush behind him off of the side of the ridge. The deer will walk down the top of the ridge when traveling through. If you set a stand to either side of the ridge crest, the deer has the vantage point and can spot you easily. Big pines are usually the favorite type of tree for Knight to set a stand on the ridge tops if one is in bow range of some acorn trees. He generally hunts the oaks along the ridges in the morning hours. Knight will place game cameras out along the ridge to determine deer moving and feeding times. Deer require water almost every day, especially in hot, dry conditions. September through October can be some of the driest months of the year. During rain-starved periods in the fall, stand sites near a water source is a good bet. Creeks, rivers, lakes and other spots that hold water are prime treestand locations. Hunters should search for trails leading to the water source. Low lying areas and bends in creeks and rivers are good starting points. Locate a solid tree within shooting range of the trail or water. In some cases deer may walk through the water. Morris says if oaks are dropping acorns, water holes can be hot for deer activity. He says hunters can ease along creek bottoms and near rivers to locate where deer are using the area. One of the toughest places to set a stand is in deer bedding areas. These locations are thicker than most of the other surrounding vegetation. Pine thickets, grown up cut-over sections and other areas where the brush is almost impenetrable is where bowhunters should concentrate. 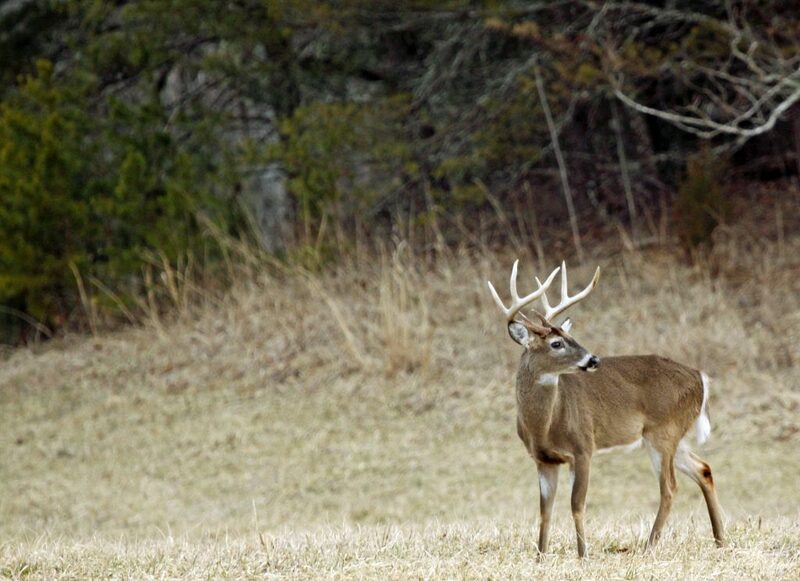 Bucks will bed down in areas where they have dense vegetation at least on three sides. One side will be slightly more open for their escape route. Bowhunters will have to use stealth tactics to locate a tree either inside the bedding area or along trails leading in or out. In these areas hunters can’t be too picky on the tree type or size. If a climbing or ladder stand is not a feasible option, a lock-on style stand may be the ticket. Again, game cameras set around on various sides of the target area will assist the hunter in stand placement. Also, if will give a good indication of the time of day the buck is entering. Finding the right sweet spot for a treestand location will require some planning, scouting and leg work for the bowhunter. But, when you are filling in the slot on your buck tag you know it has been a great day outdoors.